We encourage all our customers to buy their own domain, hosting, ssl and email marketing software online by using your credit card and personal details, so that you have full control over your accounts. This will help in avoiding any domain hijacking or hosting fraud. Domain is the name of your website. It represents your company, your brand and products. Choose a good name and buy it from either Godaddy or BlueHost. A good keyword or location specific Domain Name can help in getting higher rank on search engines. Make sure the Domain Name of your choice is short, effective and something that your customers can relate to. Get .com, .net, .ca, .tv, .org and many more. Secure Sockets Layer also called SSL Certificate has become a mandatory installation for every website. You will get better ranking on Google if you use Secure Certificate. 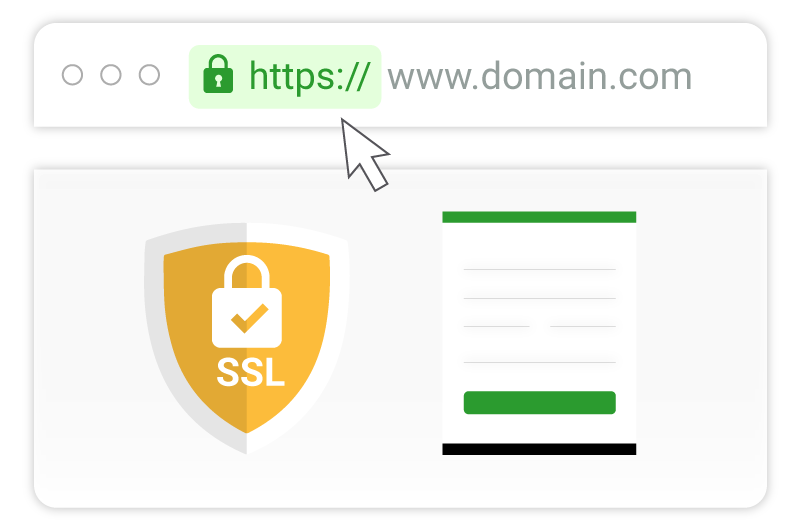 SSL makes sure that your website domain is secured for users. You may have seen it in the browser bar that goes green when you use the SSL Certificate. Email Marketing is a powerful strategy to build subscribers list and promoting your products and services by sending periodic newsletters. With Aweber and MailChimp email marketing, you can automate your email and broadcast it through bulk email list. The more subscriber you have the better chances of making sales. Build a qualified lead base with email marketing and automation.